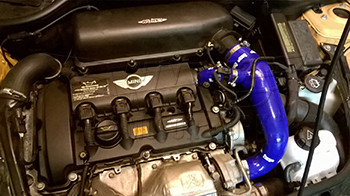 Forge Intake Hose for the R55 R56 R57 MINI Cooper S. This intake hose conects to the mass airflow sensor and goes to the inlet on the turbo. 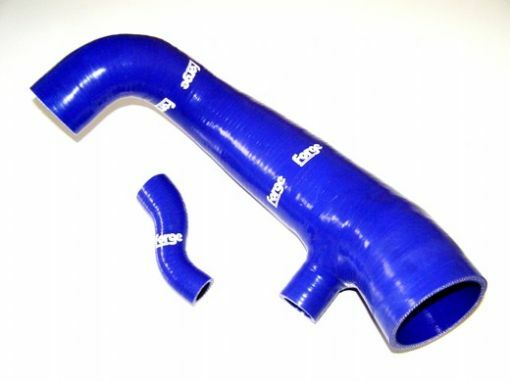 Made of silicone it is made smoother to improve the airflow going into the turbo and add style to your engine bay. Hose clamps for install are included. This is NOT a direct OEM replacement for the N14 engine in a 2008 R56 Cooper S. The breather hose is in different position. Oops, user error! Ignore my review above. I now have this installed with the help of Way. No more vacuum leak and a happier engine. Engine sound might be a bit beefier, but it might just be my imagination. Noticeably better throttle response under 2k RPM, but this may be the lack of a leak rather than the changed intake hose.